“Intimate” is not a word to describe the Grand Bazaar. The first sight of the heaving streets and arcades of this Istanbul market is one you’ll remember. There are 64 lanes within the covered market proper, and 2,000 shops. Nowadays, there’s plenty of average junk on sale and much that you could easily find at home, but there’s just enough of the real thing—gold, carpets and leatherwork—to make a good purchase. And it’s a thrill haggling with traders in a medieval market. Make sure you poke around the alleys to discover tiny, out-of-the-way workshops. But don’t buy food or drink here, it’s cheaper in the surrounding streets. If you arrive at night make sure you have a window-seat on the plane. Snaking in a black line through the pulsing city lights below you lies the Bosphorus—the narrow straits dividing Asia and Europe. You’ll see the minarets of the Blue Mosque and the Aya Sofia—for a thousand years the largest enclosed space in the world. Up on Seraglio Point is the palace of the Ottoman sultans, with 400 rooms given over to the famous harem. Out on the Sea of Marmara hundreds of ships lie scattered at anchor, waiting their turn to traverse the straits to the Black Sea. The lone gleam of ferries bob across the water connecting the city. Once it was Constantinople, capital of the Eastern Roman Empire. Before that, it’s Greek founders called it Byzantium. This was a global metropolis 1,162 years before Columbus landed in the Americas. It’s the only city in the world on two continents. A hub upon which the spokes of two empires have spun, and a bridge crossed by countless cultures. View from the Hippodrome of the Hagia Sophia, Istanbul. I’ve had the luck to visit Istanbul several times over the years. In fact, in 2009 I spent several months immersed in Turkey, travelling all over the vast country, from the Turquoise Coast to the Armenian border and back. 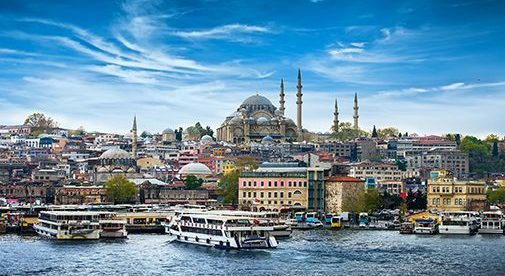 Istanbul was a world-class city when only imperial Rome and a handful of others could compete. It’s a unique and heady mix of east and west. In the Middle Ages Italian traders came to do business. Venetians and Genoans set themselves up in their own neighborhood called Pera—modern day Beyoglu. They brought with them their architecture, their food, and their style. French writers and artists joined them from the 18th century onward, eager to experience the melodies, fragrances and sights of the exotic East. The sultans employed French architects, and the European quarter’s main shopping street, Istiklal Caddesi, became the Gran Rue Pera. Then, along with the Ottoman Empire, the city declined in the 20th century. During the global crisis of 2008 prices in Turkey took a nose dive. When things recovered in 2012 prices rose fast as the country’s growing middle class got access to financing and wanted to spend. But with a failed 2016 coup, economic woes, and the war next door in Syria the growth has slowed. It’s the kind of mix that either makes for a crisis buying opportunity or means you should stay well clear. Istanbul’s Istiklal Caddesi is one of the busiest shopping streets in Europe. It might be at the very edge of the continent but it still counts. Nearly a mile long and every inch pedestrianized, it heaves with shoppers during the day and it’s thronged with party-goers most of the night. Istiklal is at the heart of Beyoglu—the old European quarter—and it’s where western chains like Starbucks rub storefronts with fashionable local boutiques and hip cafes. You’ll find a good English-language bookshop, cinemas with the latest movies in English, top-class cuisine—from Italian to Asian fusion—and good draft beer. A 15-minute walk east of Istiklal, downhill toward the Bosphorus, is the district of Cihangir where wealthy young Turks sip mochas and lattes on Italian-style cafe terraces. The city’s artistic community is well embedded here. Some expats describe it as Istanbul’s Greenwich Village. There are expensive wine stores, fancy tattoo parlors, and upmarket antique stores. Around there a Turkish tea will cost you twice the price of elsewhere in town. It’s not just tea. Property prices reflect the district’s popularity. A 135-square-meter building was for sale there for $425,190. And it needed some work. A one-bedroom, 100-square-meter apartment with sea views was selling for $398,571. It lacked the sea views of Cihangir but it was closer to the action and there’s less walking up and down hill. It’s an old neighborhood with houses over a hundred years old, complete with the characteristic cumba—the overhanging bay-style window you’ll see around the city. Many houses in Tepebasi were dilapidated. But on every street you could find a couple of recently renovated properties—a neighborhood in transition. French, Italian and Turkish buyers were snapping up low-price buildings and renovating them into pied de terres. (The law says you can do what you like with the interior as long as you leave the facade.) And there were tax exemptions on historic properties. Many of the renovated buildings were being flipped, sold on to Turks who then rent the apartments as vacation rentals ($40 to $60 a night), or to young professionals like those who live in Cihangir. I saw one 125-square-meter house that sold to an Australian gent for $47,837. He then spent $19,000 on its renovation and sold the property a year later for $116,956. Of course, this opportunity has past, but it’s a good example of the sorts of “hidden in plain sight” opportunities that exist all over the world. Know what you’re looking for, pay attention to the details, walk down the right streets, and all sorts of secrets reveal themselves. And whatever you do…make sure you visit Istanbul someday. Gulls whirl around the minarets of the Blue Mosque and the call to prayer echoes around the Hippodrome where chariot races and gladiators once entertained the mob. You may not catch a glimpse of a harem girl, or the “outrageous, outlandish, extravagant, thunder-and-lightning costumes” Mark Twain reported seeing on his visit. 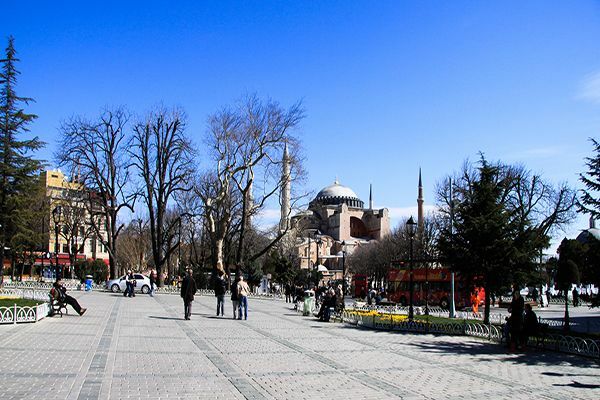 But Istanbul is still a place to fire the imagination with all the romance, strangeness and luxury of the East.